Ted Wears Organic is a funky new independent kid's clothing brand made in Britain by Vicky, a mum who needed practical playwear for her own little toddler so started making and selling her own range. Using gorgeous organic cotton with a Scandi-style vibe the pieces have been designed to be mixed and matched so you can build the perfect outfit for your little one. The boys have loved showing off their new threads; read on to find out more and take advantage of my exclusive discount code! Ted Wears Organic has a pick 'n' mix wardrobe principle. The range starts at £6.00 and features tees, trousers, dresses, skirts and hats. You decide what items you want, choose your fabrics and the garments are made to your requirements. There are several different fabrics to choose from, with coordinating colours and prints, so you can mix and match to your heart's desire! Have you ever heard of maxaloones before? I hadn't until I was introduced to some from Ted Wears Organic. Basically, they are bottoms that grow! They have a waistband and cuffs that can be folded up and down to extend the length, so this one pair of bottoms can fit from age 6/9 months right through to 3 years. J could still be wearing these same maxaloones in 18 months time! There is also a special "bum circle" which allows for a better fit over cloth nappies - J is wearing a cloth nappy in these photos and, as you can see, they fit perfectly! This little slouchy snap hat is a beanie with a twist - literally! The hat is oversized at the top for a slouchy look and has a snap at the back so you can twist the fabric round for a super cool look. 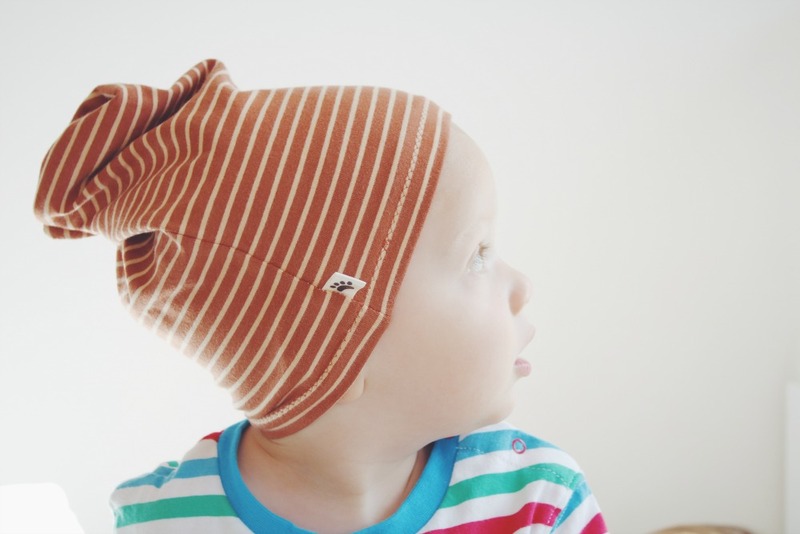 The hats are made with the same organic cotton as the rest of the range, so it's soft, stretchy and breathable - perfect for the chilly spring days. Little N is obsessed with his long-sleeved tee and classic harems and has been insisting on wearing them to preschool. I'm not too happy about this as I don't want them to get ruined! I can't blame him for wanting to wear them as they're perfect for running and playing in. The sizing is great - these are size 3-4 years which is perfect for 3.5 year old Little N.
The harems have a drop crotch and a slim fit in the lower legs and go really well with raglan style of the tee. I love the shark print, and the red on the cuffs and neck looks striking against the grey. You can have all of these garments made up in any combination you like though! The boys clothes from Ted Wears Organic are all beautifully made and perfect for playing in. They can run and play freely, and everything washes really well, too. To see the rest of the Ted Wears Organic range head over to the Etsy shop. You can also find Ted Wears Organic on Instagram and Facebook. And if you like what you see you can get 20% off until 08/05/2016 using discount code 'SHESAID20'! I was sent these items to review. These are gorgeous! I love the funky prints and can easily see my boys wearing them. What a great find! There is plenty for girls too. Check the shop or fb page for some lovely modelled photos of my friend's little girl Alice.